Encouraging accepted students to post on a school’s social media sites is a common goal at EVERY higher education institution. Throughout their college admissions process, many students may be “lurking” on several social media and campus websites, meaning they are looking, but not liking or commenting. According to the Pew Recent Center, “Facebook users “like” their friends’ content and comment on photos relatively frequently…” As a result, it may take some incentive for students to actively participate on a brand or collegiate social media site. The question is: How do you increase the likelihood of accepted students interacting with social media and sharing their picture? 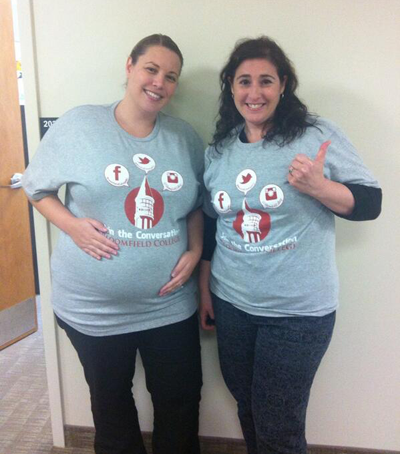 According to Jessica Zawerczuk, Assistant Director of Marketing at Bloomfield College, the Accepted Certificate T-shirt promotion has successfully increased the level of photo-sharing and overall engagement across all social media platforms: Facebook, Twitter, and Instagram, since the campaign started three years ago. Sharing a picture with an Accept Certificate is a way to show excitement and school pride with family and friends. And we all know excited, accepted students can be influential, not to mention FREE viral marketing for a college. More importantly, accepted students are connecting with the school via social media prior to arriving on campus in August. This has made students feel more comfortable on Bloomfield College’s social media sites as a venue to ask questions and meet other students. Bloomfield emails a note of congratulations and asks student to take a picture with the Accept Certificate. In return, student will be sent a t-shirt. Student posts picture to one of Bloomfield College’s social media pages, choosing from Facebook, Twitter, or Instagram. Bloomfield looks up high school student’s name in contact management system (as clearly written on the Accept Certificate in the picture), and mails student a t-shirt and a handwritten congratulations note. Additional Uses – Admissions Counselors and Student Ambassadors wear the same shirts at campus events. They are also used as prizes for Open House events. 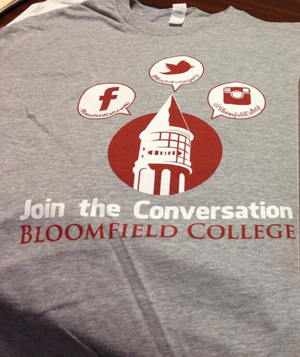 As another touch point in their overall marketing mix, the t-shirts effectively reinforce Bloomfield College’s social media strategy that is actively promoted through web, email, print, social media advertising, and onsite at admission event tables. Account Manager Paige Wagner helped Bloomfield College find a gray, Port & Company 100% ring-spun cotton tee (item # PC150). An extra soft, yet durable fabric, ring-spun cotton is higher quality than just your average t-shirt, so it will be more comfortable and appreciated, thus more likely to be worn. This is an important consideration when buying t-shirts because repeat wearing of a shirt helps gain more exposure for your school. The quality of an item also reflects your brand, making it is beneficial to invest wisely in apparel. With over twenty colors available, this t-shirt is bound to come in a color that is ideal for any school or college. Available sizes range from small to 4XL. Unlike previous year’s shirts that had only promoted a single site, this year’s t-shirt design included Bloomfield College’s accounts for Facebook, Twitter, and Instagram. The two color screen-imprint really stood out against the gray background. Each year, Bloomfield College has received an overwhelmingly positive response to its t-shirts. Targeted students (and sometimes parents) are seen wearing the shirts in the community. Current students frequently ask, “How can I get one of those?” It’s clear that Bloomfield College Admissions has selected and designed a popular promotional item for students! From a numbers standpoint, the pictures shared doubled to eighty posts from 2012 to 2013. Each year the number of posts surpasses the previous year, and the incoming class is projected to be even higher than last year’s submissions. Students have even started posting pictures before Bloomfield College Admissions sent out instructions, an indication that the Accepted Certificate promotion has truly gone viral! This is an excellent example of creating continuity and growing engagement year after year with an effective social media campaign that uses promotional products as incentives.